The Black Hole Army comes storming back in this worthy successor to an award-winning strategy game. Rain destruction upon their foul legions by ordering your troops effectively and overpowering your enemies with new Super Commanding Officer Powers. Then, see how your tactics stack up to your friends� in 4-player battles�all with one Wii U. 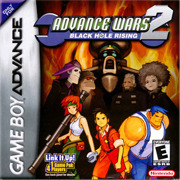 Take control of more units and battle on more maps than even the original Advance Wars had to offer. More terrain means more options, and more options means crazier creations. So employ every feature of the robust map designer to craft punishing maps, and then challenge the CPU or your friends on the battlefield. After a few battles, take your hard-earned points to the Battlemaps shop to purchase new maps, challenges, and Commanding Officers. You see in Japan it's included with AW1 so thats why its "free" in a way.